The United Verde Hospital was constructed in 1926, to replace the old hospital constructed in 1917, when a fault shift, due to blasting, damaged the south wing. This is the only photo known showing both hospitals before the removal of the damaged wing. Once patients and equipment were moved to the new hospital in January 1927, the wing was removed and with some major remodeling, became the Clubhouse Building and still stands – minus the south wing. Another building, the original Jerome High School, was damaged by the same fault and had to be torn down. An additional major building, the United Verde Apartments, was missed by one foot from being damaged by the same fault. 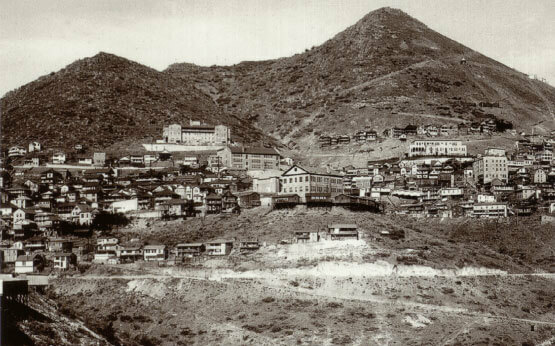 The strange location for the 4th and last hospital built (now the Jerome Grand Hotel) was due to the known stability of the ground. The building plans are dated February 1926, and this 30,000 sq. ft. poured in place concrete building was opened in January 1927. It featured patient call lights, balconies, sun porches, emergency backup lighting, Otis self service elevator, ice making room in Arizona, laboratories, X-ray, major and minor surgical facilities, men’s, women’s and children’s wards, private and semi-private rooms, blanket warming closets and housing for some staff. 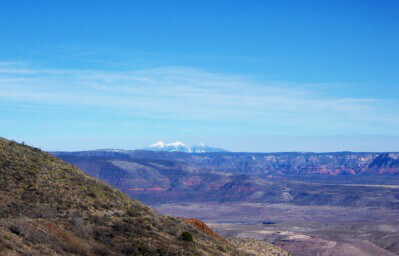 In 1930, it was considered the most modern hospital in Arizona and possibly the Western States. William Clark used this as just another marketing tool to attract the best employees. Good housing, great schools and the top medical care available. 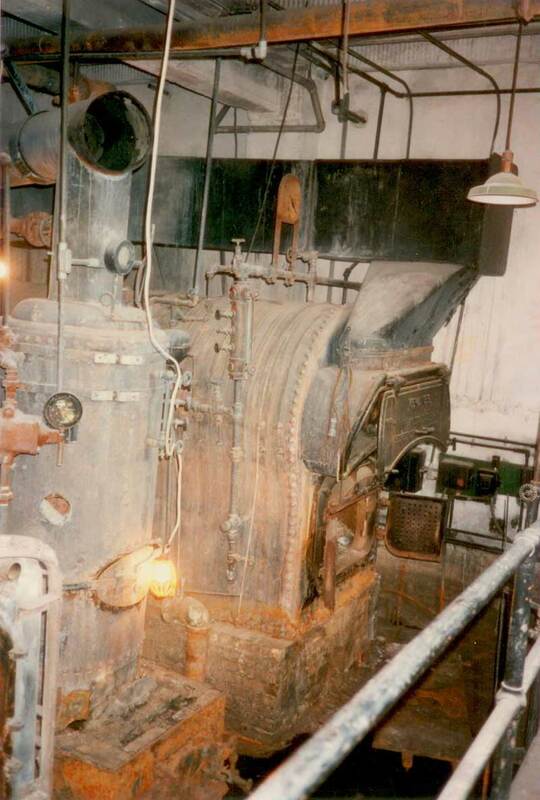 The building was originally equipped with three boilers. 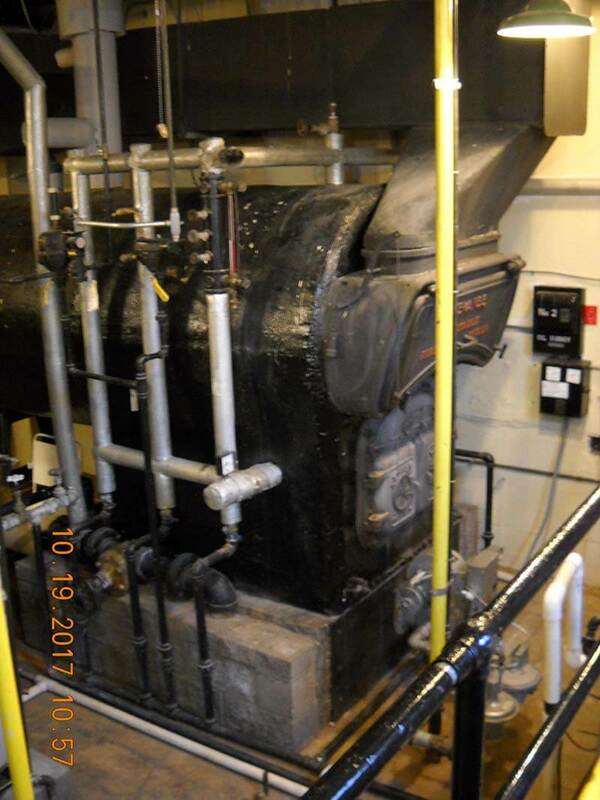 The 50 Horsepower Kewanee low pressure steam boiler for heat and still being used. 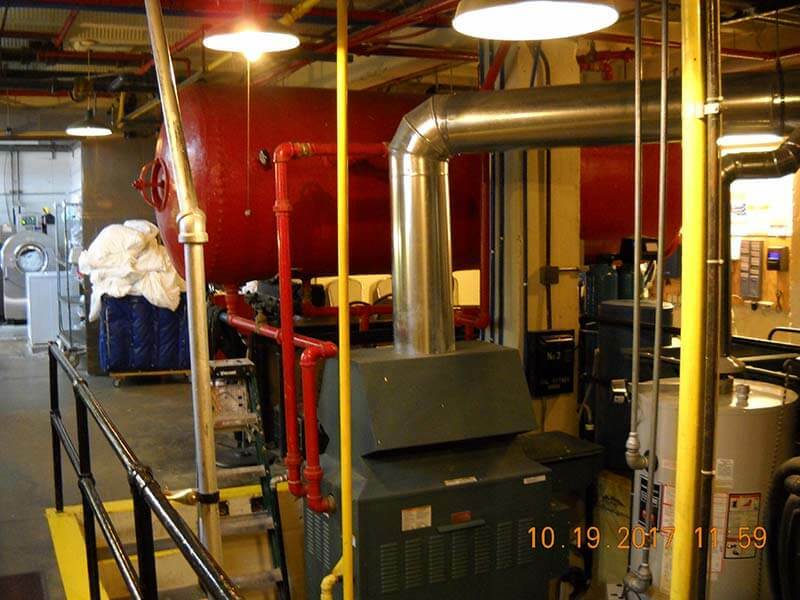 A high pressure steam boiler for sterilization, which was given away to be used on a steam engine and a hot water boiler, which was next to the now red 1000 gal. hot water tank and had to be replaced due to missing parts. The boilers are all placed in a pit designed to both serve as a place to flush out the boilers and catch water from two weep drains from the building foundation. Water released into the pit flows to a lower tank from which it is pumped out. The vacuum or recovery tank collects condensed steam (water) from the radiators and then pumps it back into the steam boiler. The system is fully automated as it was originally designed. 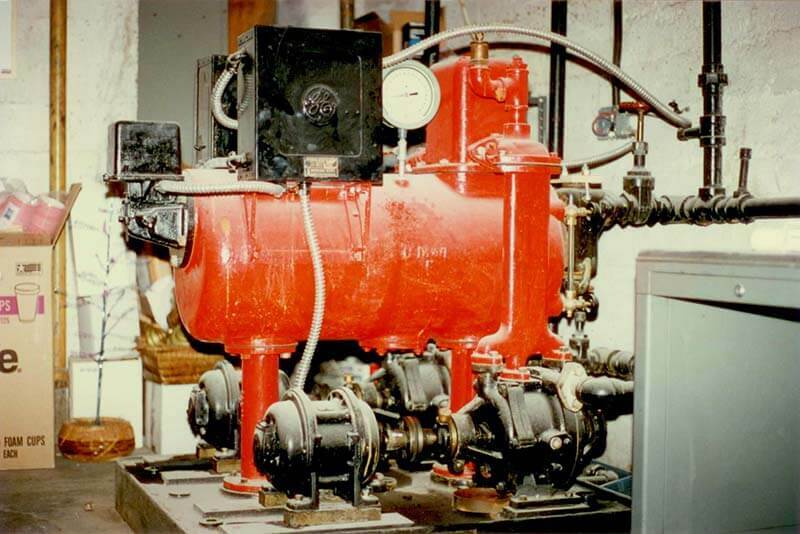 The Kewanee Boiler Co. and Nash Engineering Co. (manufactured vacuum system) were still in business in the 1990’s and provided us with information and some parts. The over 90 year old GE motors still work the vacuum pumps! 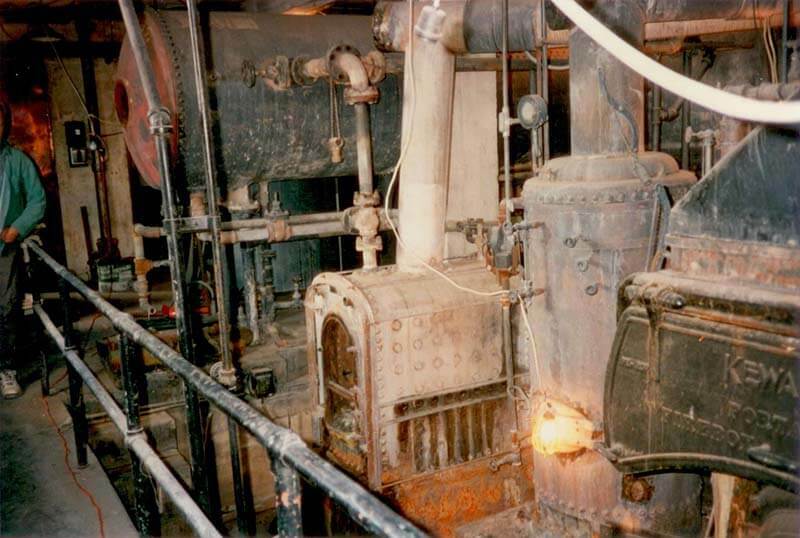 1997 Photo showing boiler vacuum pumps. Phelps Dodge Mining Corp. acquired the United Verde Jerome Mine holdings in 1935 and continued to operate the United Verde Hospital until it closing in 1950. The hospital was maintained fully furnished for approximately 20 years, after which, Phelps Dodge knew it would never be used as a hospital in the future. Most of the furnishings were removed in the 1970’s and 80’s and Phelps Dodge would over time hire a live-in caretaker or lease it to a family just to keep it occupied and safe from vandals. After the death (suicide) of the last caretaker in the 1980’s, the building was boarded up and watched over by the local police and small staff still at the Phelps Dodge Headquarters in Jerome. While some vandalism did occur over time, this added an incentive, for liability reasons, for Phelps Dodge to sell. In December 1993, an offer to purchase was made to the Phelps Dodge Corp. by Larry Altherr, of Phoenix, Ariz., and possession was taken May 29, 1994. Larry Altherr still owns and operates the Jerome Grand Hotel. In 2003, an added fixture to the building was, and still is, parked in the Hotel garage. 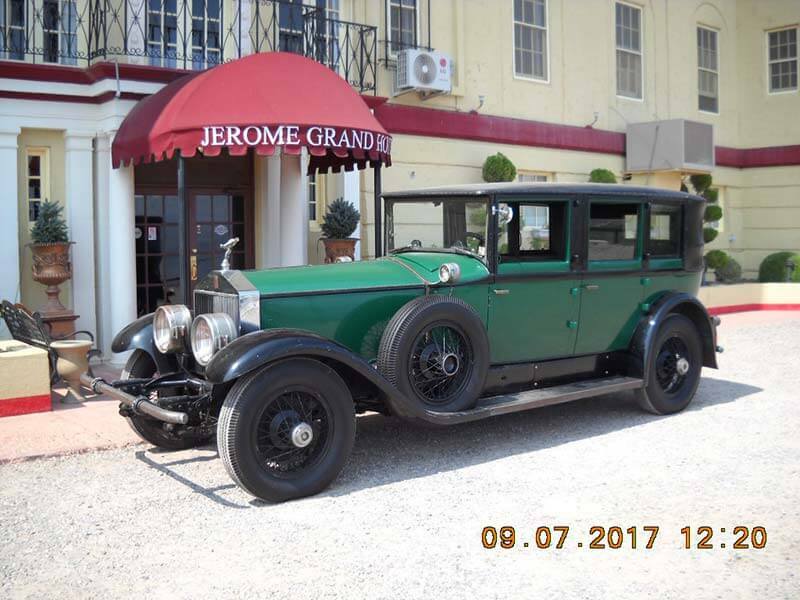 The 1928 Springfield Rolls-Royce Phantom I Lonsdale has been driven to Phoenix, Flagstaff, Prescott and Sedona and is now only used for parades or shows. The car is in original condition for the most part and sports a Brewster body. It has just under 93,000 miles and was made in America. Rolls-Royce produced cars in Springfield, Mass., for 10 years saving import fees on their cars from England and providing the U.S. with the steering wheel on the correct side. Some features used on the American built cars first were then used on the English models such as bumpers and a chassis lubricating system. Royce, himself, saw no need for bumpers but later decided it was a good idea. Leaving Hwy 89A, you enter Hill St. (right) which starts out as a one lane, two way road. For this to work as a hotel in Arizona, some negatives had to be overcome. To start, Jerome was just not that busy in 1994 and very seasonal on top of that. 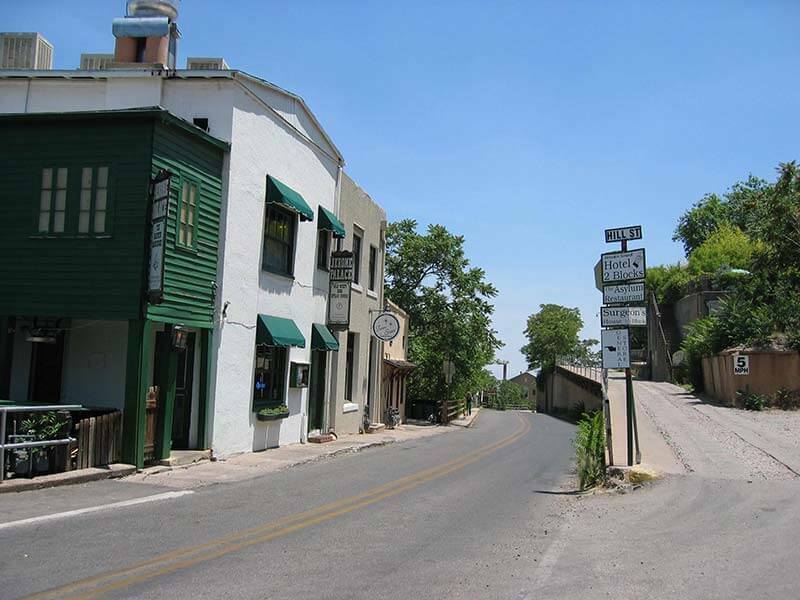 The beginning of Hill Street leaving Hwy 89A to the Hotel starts out as a two way, single lane road and located one level above the sometimes busy Main Street where 99% of the shops and sometimes opened restaurants were located. The Palace Restaurant, now Haunted Hamburger, was opened in 1994 and is located across from Hill Street. This was the first restaurant serving lunch and dinner to have dependable hours and was the first to start attracting people one level above downtown. Few people drove in 1926, when the hospital was built and only 12 spaces were provided. Over 1000 dump truck loads were excavated to make the now 70 spaces for the Hotel and Restaurant. Excavation was done during the first two years of renovation and it wasn’t until July 1996, the first rooms were ready and the building opened. In 1997, the Grand View Restaurant and Lounge were opened but it soon became apparent that leasing the Restaurant was a better plan and in 2003, the Asylum Restaurant was opened and still continues. Fire is a major concern for any hotel, new or old. The United Verde Copper Co. insisted the building to be built fire proof and be able to withstand major blasting from the mines. Each floor has three fire zones and when the stairwell doors close, a 6 hour fire break between floors. This resulted in what is termed as an above ground bomb shelter in the Spanish Mission style. All exterior walls, floors and roof are re-enforced poured in place concrete with the only wood used in construction being doors, windows and built-in cabinets. Walls between rooms are compressed gypsum blocks plastered on both sides and ceilings suspended metal lath and plaster. We added a full sprinkler system and alarm system (inspected yearly) making this the safest building in Jerome for fire safety. One of the big negatives was the building just looked spooky!! In an effort to complete construction on time, the original colored veneer stucco was applied too soon and lime leached through making the exterior look 100 years old when it was new. Located high up the mountain, set aside by itself with the operating windows facing Hill Street added to the Frankensteinish appearance which, some loved, but not great for a hotel. Original colors for the stucco, windows and doors have been used and the awnings were added in 2006 giving a more inviting appearance. While steam heat was used from the beginning, we added evaporative cooling, pressurizing the corridors, with the guests having to open or close a transom to regulate cooling. A very antiquated system but it worked quite well. In 2015/2016, individual climate control was installed in all rooms and the transoms permanently fixed closed. When is the best time of year to visit? Our summers are quite mild at the one mile elevation and being on the east side of the mountain, we go into the shade quite early with an almost immediate drop in temperature. 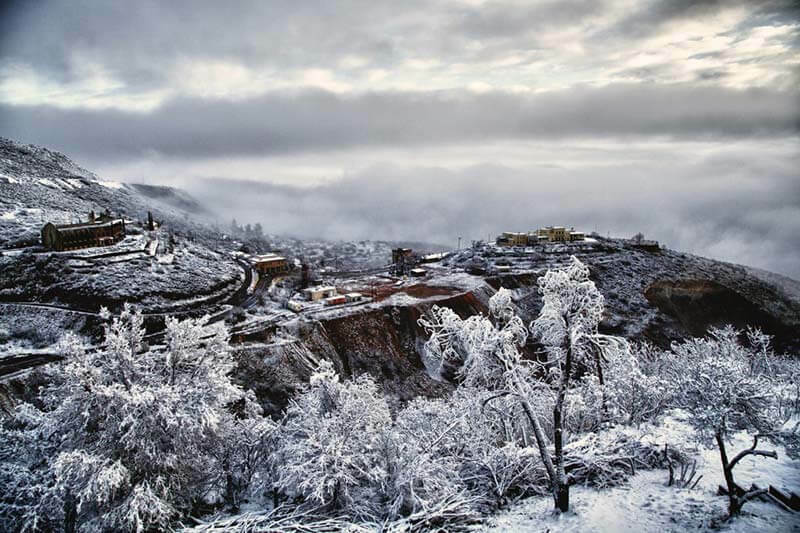 During the winter, being located on the high side of the Verde Valley, cold air drops during the night forcing warmer air up and our overnight lows are often 10 degrees warmer than Cottonwood at the base of the mountain. 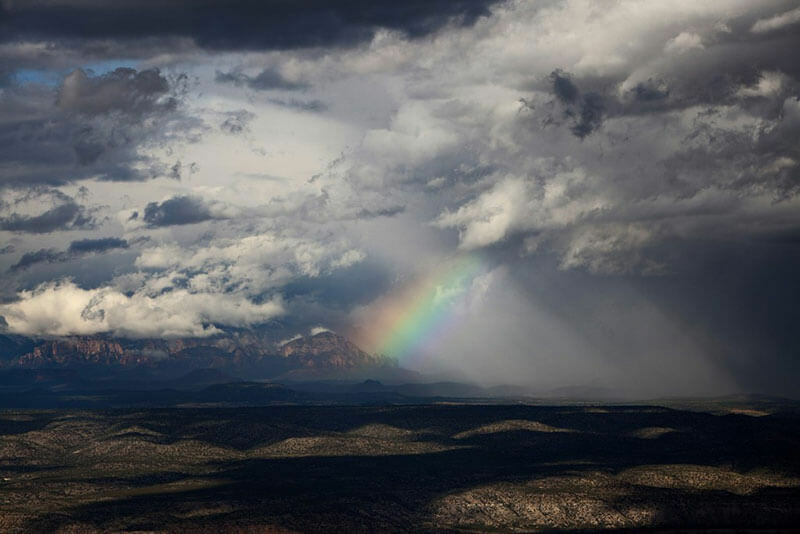 During either a rain or snow storm, the views from the Hotel take on spectacular wonders. Below are some pictures taken at different times and weather conditions of the year. Is the Hotel haunted? Any good historic building should have some mystery to offer. Most buildings that have been around a long time will have had some rumors and gossip. 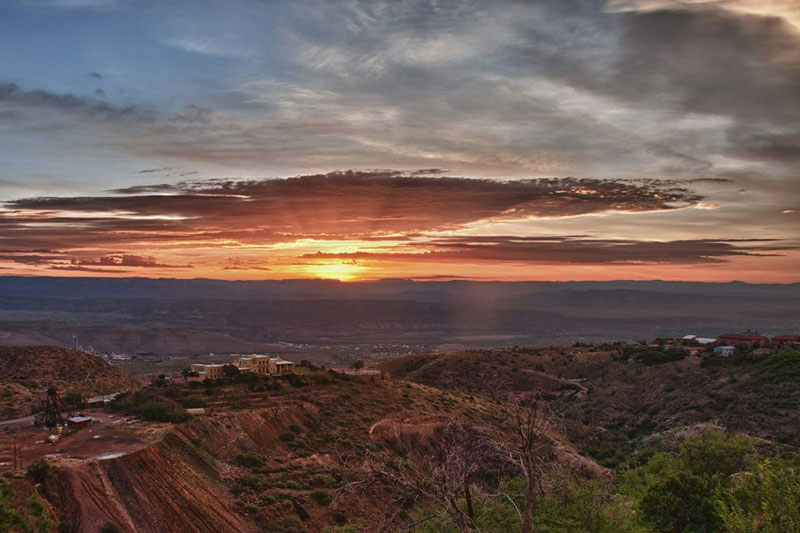 Well, to be honest, the Jerome Grand Hotel was the perfect storm for rumors and gossip and some strange occurrences have been documented over the years. 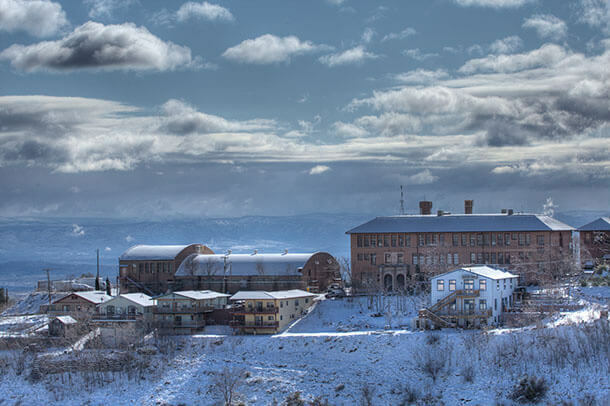 It was originally a hospital, built on a steep slope looming over the Town. Most kids in town were marched up to the hospital for any inoculations they received and when one in their family was sick, they would have to visit them in the hospital. The hospital was closed in 1950 and over the years gained the patina and feel of having been abandoned and left to the elements. 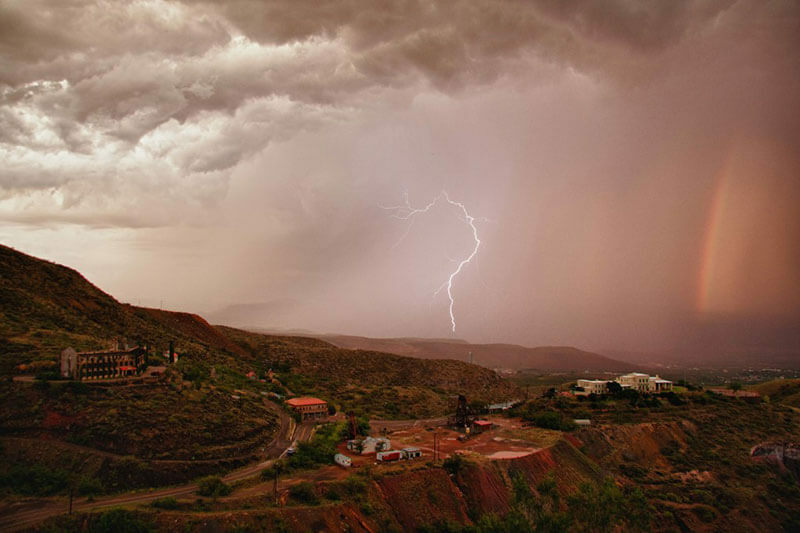 Then, with the official closing of the mining operations in Jerome, in 1953, the entire town took on an ominous look and feel. The owner moved in and started work in 1994 and said that during the first month, there seemed to be an overcast of uncertainty. It was a feel that your presence was in question – not sure if you were welcomed or not. In the second month, this “feeling” started to relax and then one day during the second month, it totally went away. During the following months, there became a “feeling” of a protective nature. The owner is not into hauntings nor ghost stories but said if the spirits, that be, are happy, I’m happy. Yes, there have been a couple of TV shows on the “spirit” nature of the Hotel and a number of psychics visiting the property. The owner says that out of the many visiting psychics over the years, three of them seemed to pick up a number of things both past and present. Two in particular said “the Head Nurse” / “the Nurse in charge” was upset with the removal of the desks. Both psychics were in what is now the Restaurant/Lounge area and originally the Dispensary and main entrance for the Hospital. The owner told each psychic the original Dispensary desks were in storage. The psychics did not know each other and visited more than a year apart. Later, upon leasing out the Restaurant/Lounge in 2003, the new tenant somehow saw two cabinets stored at the back of one of the garages in the hotel. He asked the owner what they were and if he could use them in the restaurant area. Given permission, the original Dispensary counter height desks were relocated within a few feet of their original placement. To date, the “Head Nurse” has made no more complaints – – well, at least about the desks. The Hotel owner will admit that if there are spirits, they must be a lot happier occupying a hotel instead of a hospital. They are dealing with a clientele that are here by choice and not necessity.